← How to convert Word DOC files on Windows Azure to PDF files with VeryPDF Cloud API Platform? Is it possible to post a data stream to your server instead of file URL? How to stitch or print two PDF files into one PDF page? How to combine two PDF pages on one page? I have 2 pdf files, each contains 1 page. I want to print them to 2 sides of 1 paper (my printer got double-side printing feature). 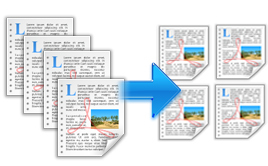 How to Stitching PDF Files into the Same PDF? What is good PDF tools for Stitching PDF Files into the same PDF? VeryPDF PDF Stitch is a useful application which is designed to stitch multiple PDF pages to one PDF page with easy operations. This application is fully compatible with Windows and Mac OS system and the operation ways on both systems are the same. This guide will show you how to use the application to stitch PDF pages on Windows system. How to stitch multi-page PDF file to one single PDF page vertically? Stitch ( join / merge / concatenate ) PDF Pages into one page. How to change the page orientation (portrait or landscape) by PDF Stitcher? How to stitch PDF pages horizontally? How to stitch or combine two PDF pages into one PDF page? How to combine pages in one PDF into one page? This entry was posted in PDF Stitcher and tagged pdf stitch, stitch multiple PDF, stitch PDF, stitch PDF pages. Bookmark the permalink.